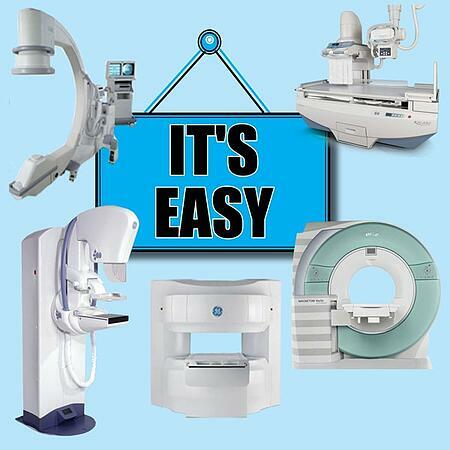 Sell Your Used C-Arm & Used MRI - It's Easy! Do you want to upgrade your C-Arm but need to get rid of your old one first? Are you updating your surgical suite and only want new equipment? Or maybe you’re ready to get rid of an MRI, Digital Mammo or Bone Densitometer. No worries! At Atlantis Worldwide, we’re always looking for used radiologic equipment. For more than 25 years we’ve purchased older medical equipment directly from hospitals, surgery centers, service engineers, biomedical and clinical engineers, materials managers, supply chain directors and sales representatives. We work directly with you, so there’s no middleman to reduce your profits. If you want to liquidate assets and make larger budgets available, selling your used CT and MRIs makes sense. Plus, by selling your equipment to a reputable firm like Atlantis Worldwide, you’re protecting the environment since we refurbish most used systems back to OEM standards. Yes, you can just choose to sell your used equipment to us, but if you want to upgrade the system you’re getting rid of, we can help there, too. Our sales team can conduct trade-in transactions and get them fully functional to original equipment manufacturer’s specifications. Then some other facility can put them to good use! It’s a win-win-win. Before you start to panic because you don’t have experience in this kind of transaction, relax. Our dedicated purchasing department will do all the heavy lifting, so you can focus on patient care. Whether you have a surgical suite, hospital, clinical office or medical facility, we can help remove your old equipment and even help bring in the new. We’re always looking for medical equipment by GE, Philips, Siemens, Cannon(Toshiba), Hitachi and other brands. And we establish fair market value for the equipment you no longer want. If you’ve got equipment you want to sell or trade in, just click here! You’ll provide your name, address, email and description of the equipment you want to sell, including its condition. The team at Atlantis Worldwide will be in touch with your promptly! It’s also wise to have photos of serial tags and any other identification tags for your equipment. They are usually found on the backside of your equipment. Other photos that can be helpful include back-up software disks and operating manuals, injectors, coils, probes, buckys and other system accessories. The more documentation, the better! You can also download our "Dos and Don’ts about Selling Medical Equipment" Here! You can buy refurbished radiologic equipment with confidence, because it’s undergone our strenuous and fastidious refurbishing process. It’s been tested and cleaned. Missing or broken parts have been repaired and replaced. It is al brought back to its original appearance, having been sanded and painted—even decals are replaced! Rest assured the equipment is now fully functional, patient ready and covered by an impressive warranty. Ready to find out more? Contact Atlantis Worldwide today.